Simple setup useful for testing, but you may want to consider using one of the other types of setup for your production servers. The only thing you can customize here is the port. This port has to be reflected in monitor config, in spm.remote.jmx.url argument, as shown below. You should define the role and its password in separate files for monitored service (say for your tomcat server /home/tomcat/passwordServer.txt) and for monitor itself (say /home/spm/passwordMonitor.txt). Each file should be owned by the user which runs the process (in case of passwordServer.txt, owner could be ubuntu, jetty, tomcat... whoever is running the monitored service; in case of passwordMonitor.txt, user always has to be spmmon which is created during agent installation). Access rights on these files should be set to 600. Note: when choosing the role name, make sure it is defined in jmxremote.access file of your JRE (for example, in location like: /usr/lib/jvm/java-7-oracle/jre/lib/management/jmxremote.access). By default, role named monitorRole is defined and can be used out-of-the-box. If you want to use some other role name, you should first define it in jmxremote.access file. The passwordServer.txt file can have multiple such lines, while passwordMonitor.txt must contain only one line and this line has to exist in the passwordServer.txt file. Port, password and keystore path should match your local setup. where spm.remote.jmx.url argument, trustStore path and trustStorePassword match your setup. See Starting with Java Command. In some other cases, you may want to make similar addition for CATALINA_OPTS variable in your bin/catalina.sh file. No need for any adjustments since the monitoring agent uses JSON API calls to collect Elasticsearch metrics. In case you are running hbase master and region server on the same machine, ensure they use different JMX ports (and adjust the config of their monitor properties files). When installing spm client, both monitor properties files will be prepared for you (exact locations and names for your application are mentioned in step 3 on https://apps.sematext.com/ui/monitoring). 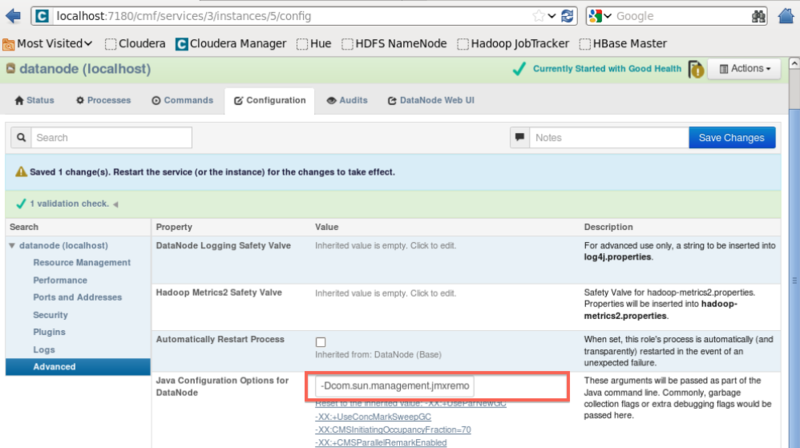 If you are using CDH GUI to administer your Hadoop setup, you can adjust "Java Configuration Options" for each Hadoop node through the console. For instance, for DataNode, you would go to Services ==> hdfs ==> DataNode (link in status column) ==> Configuration. Expanding options shown for datanode under Search column (click on arrow) shows Advanced. Under Advanced, Value for "Java Configuration Options for DataNode" should be with same values added to HADOOP_DATANODE_OPTS variable in the example above. Alternatively, even when using CDH GUI to administer Hadoop, you can still choose to manually add definitions to hadoop-env.sh file, you may just have to create it in conf/ subdir if it doesn't exist yet. For enabling JMX on Producer and Consumer nodes do it like you would do it for a simple JVM application. nimbus.childopts: "-Dcom.sun.management.jmxremote -Dcom.sun.management.jmxremote.port=3000 -Dcom.sun.management.jmxremote.ssl=false -Dcom.sun.management.jmxremote.authenticate=false"
supervisor.childopts: "-Dcom.sun.management.jmxremote -Dcom.sun.management.jmxremote.port=4000 -Dcom.sun.management.jmxremote.ssl=false -Dcom.sun.management.jmxremote.authenticate=false"
worker.childopts: "-Dcom.sun.management.jmxremote -Dcom.sun.management.jmxremote.ssl=false -Dcom.sun.management.jmxremote.authenticate=false -Dcom.sun.management.jmxremote.port=%ID%"